Vic has a home! 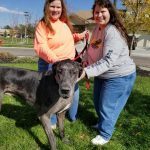 - Rocky Mountain Great Dane Rescue, Inc.
Vic has a home with his new forever family, Audria and her sister Karen, in Denver, CO! This will be Audria and Karen’s 5th Dane from RMGDRI, and we are so happy that they chose to adopt Vic! He will enjoy being the only dog in the home, and will get all the attention he desires. Audria and Karen are excited to take him for walks around their neighborhood, and look forward to lots of play time with him in their back yard. Way to go sweet boy!